A new study shows that deer species capable of building and shedding their antlers already existed about 20 to 15 million years ago, in the Miocene. The finding sheds new light on the evolution of deer. 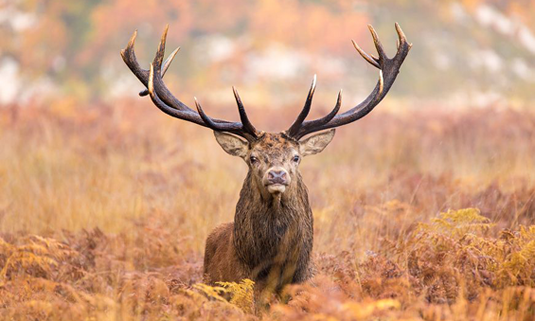 The most striking morphological character shared by all male members of deer (family Cervidae) is a set of antlers. Antlers develop from so-called pedicles and are defined as paired, deciduous protruberances of the frontal bone of the skull, which are shed and regenerated at regular intervals, becoming more complex in form as the animal ages. LMU palaeobiologist Nicola Heckeberg has now conclusively shown that some of the oldest fossil deer-like species were able to grow antlers that could be shed and regenerated. Hence these fossils can be securely attributed to the deer family. Her findings appear in the Journal of Morphology. The oldest known representatives of deer date to the Early to Middle Miocene, between 19 and 14 million years ago. It has been assumed on the basis of certain anatomical traits found in these fossils that their antler-like cranial appendages were permanent. However, a comprehensive comparative morphological analysis of fossil and extant material has now shown that the abscission area, the area, where the antler is attached to the skull, has the same morphology in some of the earliest antlered species as in extant species. This strongly suggests that they shed their antlers periodically. Therefore, these fossils indeed belong to the deer family, and do not represent members of a sister group that has since become extinct, as some taxonomists have assumed. “Nowadays, evolutionary lineages are often reconstructed by comparison of homologous DNA sequences obtained from extant species. The different mutation rates between species can be used for molecular clock analyses to yield relative times of lineage splitting,” Heckeberg explains. However, to obtain absolute dates for speciation events, well dated fossil species that can be confidently attributed to the group in question are needed. The secure phylogenetic assignment of fossil species achieved in Heckeberg’s new work helps provide such a framework for future investigations of deer evolution.